Bach Flower remedy; LOSS, MOURNING; If an animal has lost its human partner or its animal partner, it needs help to overcome the grief. This Bach flower remedy provides comfort in this case. As with us humans, also in the life of an animal sometimes the sky darkenes by grief and loss. If one partner dies or a human compagnion disappears through separation from the horizon of the animal, it will create uncertainty and grief. In such a situation the owner also suffers, so that a energy field of grief and despair arises hard to understand for animals. If a pet companion or animal partner dies, we should offer the animal a new partner, but not immediately. It has a right to mourn. If our partner dies, we also do not want to enter into a new relationship already three days later. Even a small animal mourns a loss, and we should take his mental distress seriously and offer him assistance to solve his troubles. Support the animal immediately with the soul consoling power of Bach remedy. 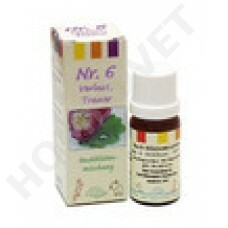 Give the tame animal two or three times daily 5 granules directly into the nose or in the mouth. Or 5 to 10 globules to dissolve in a few drops and rub it on it`s forehead. Or spray your pet with water, in which the globules were dissolved.